APN of Vodafone for Android Samsung, Micromax, Sony mobile or tablet. APN Stand for Access point name. 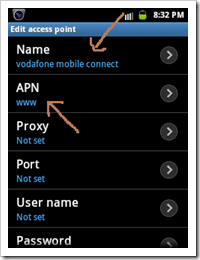 Some mobiles does not get the apn settings directly when you insert a sim, and this makes you to call customer care of Vodafone, to ask for its apn setting to run internet properly. 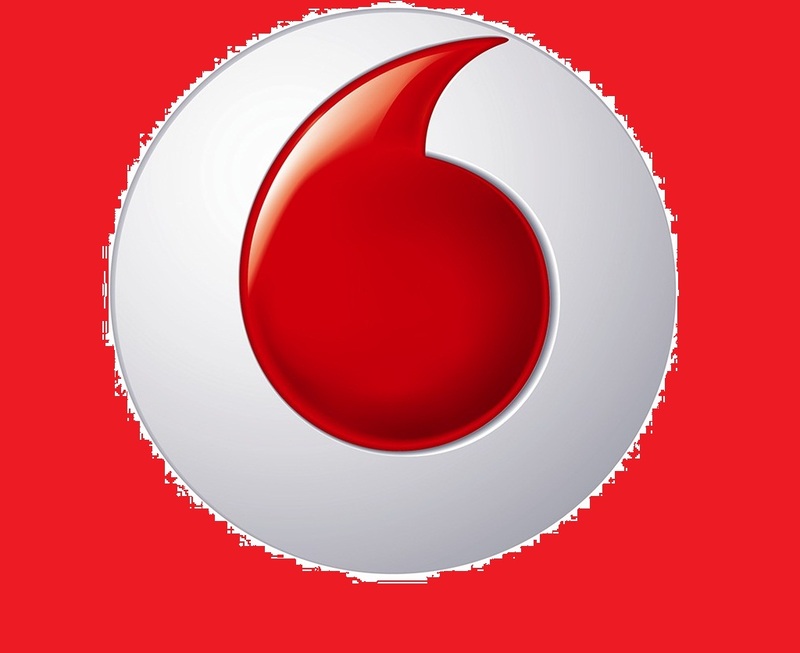 This post deals with Vodafone APN setting, while you can Add access point for other service provider also like Videocon, Vodafone, Reliance, Airtel, Idea, Aircel, Bsnl, Tata Docomo, Mtnl etc. I had experienced this problem in Samsung galaxy S, which made me to write about this information here. 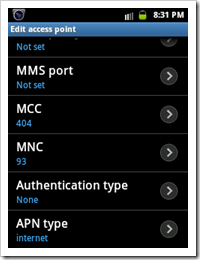 Here is the way to set apn setting in your mobile. We can apply this steps in every mobile but, i will demonstrate to set apn in android mobile step by step. For adding new APN setting, select or click on option button of your mobile and select “New APN”, or you may even edit the existing APN by selecting edit. Note: MCC and MNC code listed below is of INDIA, if you are user of Vodafone and does not belong to india, search on internet for MCC and MNC code for your respective country and network area. Don’t make any changes in other fields, i.e Proxy, Port, User name, Password, Server, MMS proxy and MMS port. I suppose that, this would make your internet connection work properly with apn of vodafone. You may also read How to make 3G or HSPA internet connection work in Android. If you are having problem in accessing internet, post your comment below with specified problem, we will look for the solution if possible. Disclaimer: Although, we have taken utmost care in gathering correct APN setting of Vodafone service provider from our reliable resources and with our own research and experience, but we are not responsible for any inconsistency and inconvenience in accessing internet as we not a part of any of the service provider. My Mobile number is 9833508760. Last month i hv rechared with internet package. Still i have 110 MB data is free and valid Jan 10 2014 for access. This is inform u that last 3 days net was not connected. I tried more time i could not get net access. Pls i need to access for some emergency work. Pleas check and inform me asap. I have Sumsung Trend Plus GT-S7580. I can not accessing net on my phone via using your instruction. Plz. help..
Thanks… the above steps worked well on my Android. Just to let you know, MNC and MCC code were already available & greyed out. For Google play store, you need to add the gmail account in accounts and sync under settings. If still facing the problem then download the 1mobile app from 1mobile’s site and from it you can download all the desired android apps at good speed, speed more than the play store. Hi, I have just purchased a new lenovo k900 and got a 3G prepaid plan. I am unable to use internet after configuring the above settings. It still says no connection and I have H network on my phone. I have MOTO G XT 1033. I can not accessing net on my phone via using your instruction. Plz. help..
Ive put an net pack of 155 five days back but i ve not received the Internet Settings..Pls help me..
Hai im using Samsung galaxy s2. Im using vodafone 2g internet plan. internet is vey slow , it’s getting only 25 to 28kbps instead of 256kbps. Please someone help me to how to get that speed ??? When you can use s2 then just get a 3g plan….2g 28kbps nai to kya 288880 kbps milega…. Hi, i can conect internet with vodaphone please help me. Iam using Vodafone 2g unlimited internet it is very very slow (not open Google page) it is chennai sim.I think chennai sim is problem. Me and my friend same problem, please help me …..
I’m not installed my 2G dongal of vodafone in my swipe andorid tablet. i reqested to you resolve my problem. Thank you sir. It worked. I have put a Internet pack it has been activated,i have the settings aiso but i can’t open my Internet Google is also not opening.can any one help me. Hello I am using Videocon VA75 tab. I am using vodafone 2g internet plan. Internet is not connecting. Please someone help me to how to get access of internet ??? Thanx ya. this was damn helped my brain chill off with a micromax phone. Fed up of vodafone’s customer care and searched on web for the settings…. its done… thumbs up…. 7. )Select option, and then save this setting. 8. )switch off your mobile and restart. dear I have using samsung pro my ph no is 9916347419 and I can’t use Vodafone internet in this mobile all network sim is browsing internet but my sim only not working plz help me. on my samsung GT I9000 phone with Vodafone connection I am able to run net based apps but internet browsing in not possible. However, in wifi mode browsing is possible but apps doesn’t work. But I don’t know lots of time I suffered net connection so pls guide me properly……how to set setting and format pls send me step by step…..
i received the gprs settings but when i enter the pin given 1234 to configure it says its incorrect . what to do . please help . i am having sony xperia c .
I was using Vodafone 2G sim in Sony Xperia Z Tab. 2 days ago the SIM card shows disconnected. Red cross mark in the corner.I have swithc on and switch off the tab twice. but nothing happening.SIM card not activated still. thank you for the guidance…. I have done the above vodafone internet configuration in my HTC Aria mobile. But still Mobile internet is not working for me. Can u please help me on this. I have MICROMAX P255 Tablet and also have Vodafone 3G Dongle K4201 I. It’s not working , when I try to connect to tablet via USB cable, the message shows “DAMAGED USB.” . Also APN Setting is doen’t save. The step by step process of choosing the APN was really helpful. Thanks. I did the above settings and gmail start working but play store is giving error of no connection. thanks for the info., but i am unable to connect to internet with the above apn settings for vodafone. if i enter the proxy address as 10.10.1.100 and port as 9401 then i get the internet connection but it is very slow and google play store does not open although facebook is opening and connecting. kindly also inform the difference between “vodafone mobile connect” and “vodafone live”. I have galaxy S4 .. didnt wrk internet can u plz help me..
I’ve did the same procedure as the instructions, but still same problem persists. Now that menu tab also i dont see on my mobile. is it hidden or deleted itself? Guys try this .. working fine..
amar 2 ta phone . micromax A190 ebong zen ultrafone 303 3g, setting er jannya bahubar phone korechhi kintu paini. tai ami vodafone cheng kore niechhi. My phone is htc desire 816 …plz help…….. I recevied setting for mobile internet and also done above mentioned setting but not able to connect with internet connection. Please suggest me another solution ASAP. I bought Micromax A109 as it was easily connecting to the Internet in india and now I reached to Qatar (gulf) yesterday and followed all the instructions given by you above, even after this not connecting with (Vodafone sim of qatar) Internet. I would request you to please help me out as it is only the source I have to connect with my family and friends. care as well as you provide the setting procedure on your website. is there different type of setting for corporate plans required ?????? please revert back as soon as possible.. I am using moto g mobile . I have a problem with vodafone ineternet . when I switch off mobile data and using wifi, main balance is reducing every minute. And giving message alert like pls recharge internet pack. So kindly give me solution. I have a xperia m..my net is still not working ..can u tell me how can I fix it.. Does the above 3g problem work on nexus 5 as well? i am unable to send and receive messages on whatsapp when 3g is turned on after i have updated to lollipop. i make the abouve setting ,but my micromax bolt a27 is not connect internet.. I have a OnePlusOne device and I have a 3G postpaid connection with home state as Delhi from Vodafone. While roaming in Mumbai and latched to Vodafone network, I am not able to get 3G connection. I have followed your instructions and but when I save the settings, it doesn’t save (and doesn’t give any error also). My default APN setting shows the MNC number of 11 (which corresponds to Delhi). When I change that to 20 (corresponding to Mumbai), I am not able to save. Pls help. It’s urgent. Thanks a lot. I cannot send SMS only through Vodafone …what is the solution for this?? Iam using micromax A77, and I activated the double data 250 3g plan, even after the above settings am getting only 2g and not getting 3g. Any one can help on this please. Vodafone gprs not working in my yuphoria mobile. I tried all the above tricks but I didn’t get “E” sign & internet connectivity. Please help any one. even aftr showing ‘E’ symbol………..my net is nt working………. I am using INtex cloud string v2.0 handset. The new jio sim is activated, I can make call to any no through the jio sim. The problem is with data connection. With wifi connection Mobile works fine, but when mobile is connected with jio sim, even google page is not opening but the connection is showing with diff color on the mobile beside the jio network bar. Please solve the problem if you can. Even when i connect with vodafone 3G, the data connection is too slow for this mobile. But sir when I will select wcdma then my network is show me emergency call only I hv 2g unlimited pack I want use it in 3g but this trick is not working I can’t select Vodafone 3g so help me how to I do ?